Shah Sahab delivers a saying that : “My father informed me that once he fell sick , so he received the honour of visiting the Prophet (Sallallaahu Alayhi Wassallam) in his dream. The prophet (Sallallaahu Alayhi Wassallam) said: “My son, how are you?” after this the Prophet foretold my father’s well being and granted two blessed hairs from his blessed beard. I was cured there and then and when I opened my eyes had I both the strands of hair in my hand”. Shah Sahab further says that his father granted him one of those blessed hair strands. Irshaadul-Mulook (Eng. Trans) p. 29-30, Mashaikh-e-Chist (Eng. Trans) p.209 and Imdadul-Mushtaq ila Ashraful-akhlaq, (Urdu version) p. 8. 1. The method of Jamaat ut-Tableegh is not in accordance with the Qur’aan, Sunnah or the understanding of the Pious Predecessors. 3. Concentrating on the prayer and leaving the fundamental creed of Tawhed (oneness of Allaah). Also saying the work of tableegh is of the greatest importance. 5. and believing the method of Jamaat ut-Tableegh is the only method of rectification and that it is complete. Abul Hasan Alee Nadwee said, “One of the disatisfactions the Maulana (Ashraf Alee Thanwee) had, was how will these people (ie Jamaat ut-Tableegh call the people to the importance of tableegh without knowledge. 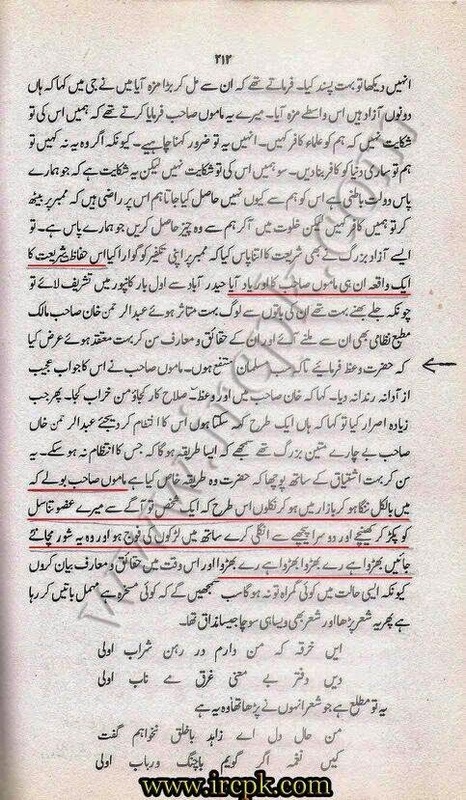 So when (the nephew of the maulana) Dhafar Ahmad (Thanwee) informed him that the speakers who deliver these lectures only speak about the issues they have been ordered to speak about and they do not speak about anything other than this, so he (Maulana Ashraf Alee) became satisfied.” (Deenee Dawat (pg.126). “The tableegh of the defective person is unreliable.” (Tadhkirratudh-Dhafar (pg.253). Bare in mind Maulana Dhafar Ahmad Thanwee addressed an individual who does tableegh according to the way of Jamaat ut-Tableegh as defective.